What happens if a MIPS eligible clinician does not report anything under MIPS for 2018? ReportingMD / FAQs / What happens if a MIPS eligible clinician does not report anything under MIPS for 2018? 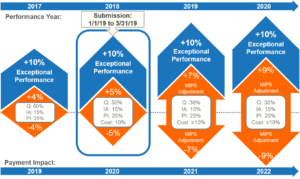 If a MIPS eligible clinician does NOT report anything for the MIPS program for the 2018 reporting year, they will be subject to a 5% downward payment adjustment in 2020.